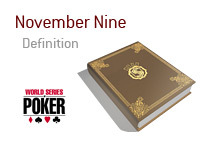 'November Nine' is a charming nickname referring to the Main Event final table at the Word Series of Poker (WSOP). In other words, the November Nine are the final nine contestants at the biggest annual event in poker. The term November Nine is relatively new. Prior to 2008, it didn't make much sense since the final table often took place in July. That all changed when ESPN and Harrah's Entertainment set out to raise the TV ratings for the event. Due to the nature of the event and television, ESPN and other broadcasters have to show the WSOP on tape delay. For ratings, this is a problem once the WSOP crowns a winner. Word gets out, and then viewership loses interest. In order to combat that, Harrah's and ESPN changed the arrangement for the final table. Now, as soon as there are just nine players remaining, play breaks, and the final table reconvenes in November for a semi-live televised event. The four-month delay has been met with much criticism from players and fans alike. However, no one could argue with the 50 percent increase in viewership, and the drama was so compelling that it was recognized with an Emmy. November Nine has become so synonymous with the WSOP Main Event final table that it will likely stick even if Harrah's Entertainment someday decides to move the event back to its original date and time slot in summer.